Achieving excellent 1080p gaming on a modestly-sized notebook for relatively cheap has long been a difficult proposition, but Eurocom’s Sky M5 R2 is up for the challenge. This $1,399 notebook comes packed with NVIDIA’s GTX 1060 and Intel’s i7-6700HQ – not just enough for 1080p, but good for 1440p to boot. Let’s dive in! After taking a look at Eurocom’s excellent Monster 4 gaming notebook earlier this year, I had immediately begun anticipating the next model I’d be able to check out. And with NVIDIA having launched its Pascal-based mobile GPUs this past summer, we figured there was no better time than now to take a look at one of Eurocom’s other gaming models: Sky M5 R2. 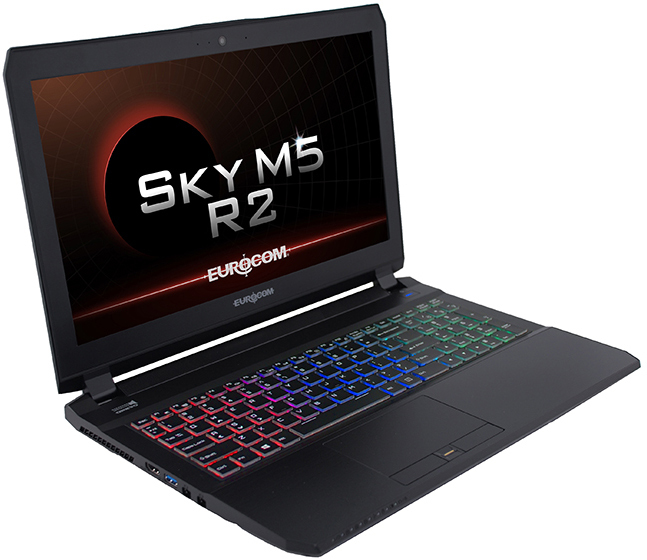 Eurocom’s Sky M5 R2 aims to deliver quality gaming in a modest form-factor – modest being that it doesn’t weigh 10+ pounds and can actually fit in most notebook bags. Part of that “quality gaming” ties to support of NVIDIA’s G-SYNC, which is even on the default $1,399 USD model – a nice touch. The notebook as tested is priced at around ~$2,100, as it includes a Windows 10 Pro license (Eurocom’s default configurations don’t have an OS), double the RAM (16GB), and Samsung’s super-fast 256GB SM951 M.2 SSD. The only GPU option available with the M5 R2 is the GTX 1060; if you want the GTX 1070, you’ll want to check out the Sky MX5 R2, and the GTX 1080, a larger (17.3-inch) Sky X7E2 or Sky X9E2. Considering the fact that the Monster 4 I reviewed before had a GTX 970M that helped deliver great 1080p gameplay and good 1440p gameplay, this GTX 1060 at 1 TFLOPs faster should be quite the treat. So without further ado, let’s jump to checking out the hardware, and then move onto the benchmarks. While the GeForce GTX 1060 is default (and exclusive) on this notebook, so too is Intel’s Core i7-6700HQ processor. If it seems odd that we’re seeing a last-gen CPU in this notebook when Intel released a handful of 7000-series models, bear in mind that all of those SKUs are designed for low-power devices, not high-end ones like the Sky M5 R2. A low-power dual-core CPU would seem a little out-of-place in a notebook like this! A couple quick things to point out about this notebook before going forward is that all of the keys are backlight (RGB, of course! ), it includes a fingerprint reader, and has space for two storage drives (eg: M.2 SSD + hard drive). It can also be upgraded to a 4K display (still with G-SYNC) for $100 USD more. As a 15-inch notebook weighing almost 6lbs, the Sky M5 R2 isn’t going to be for everyone, but it’s perfect for those who want to meet a notebook in the middle of the 13- and 17-inch form-factors and enjoy the performance that can come along with it. This notebook is in all regards high-end from the GPU to the CPU, and it’s one that can power 1440p gaming with no issue when connected to an external monitor. It also has a ton of functionality and connectivity, so let’s get on with a tour, shall we? The Sky M5 R2 is a very sturdy, well-built notebook that feels good to hold from any angle. The left side of the notebook features an HDMI port, USB 3.0 port, and dual mini-DisplayPorts to allow up to 3 monitors to be run off of this single notebook. On the right side, another USB 3.0 port can be found along with dual USB 3.1 Type-C, Ethernet, Kensington lock, card reader, SIM card extension (optional), and a trio of audio ports. Another USB 3.0 port can be found at the back, next to the power port. One of the coolest features of the Sky M5 R2 is the backlit keys, which can be configured myriad ways with the included software. The default color is blue, but given their RGB nature, you can change the keys to any color that your heart desires, and use up to three different colors all at once (split into even sections). Also worth noting is that this notebook includes a fingerprint reader, a feature I think should be more standard nowadays than it actually is – no more hunching over your notebook trying to conceal your password while in a crowd! This notebook does sport one design cue I am not a huge fan of: hinges. However, with all sorts of twisting, this notebook kept solid, so I don’t imagine that these hinges will prove to be a problem anytime soon, and not without some serious impact. To keep cool under high load, this notebook sports thick feet that will let air circulate better underneath, made even better with the plethora of exhaust areas. The back also has a large exhaust on either side, and those help: I never once experienced lag when gaming on this notebook, although I did experience quite a bit of noise (more on that later). With the hardware tour done, we can move on into a look at performance. Because Eurocom’s Sky M5 R2 sports a GPU that’s able to deliver quality gameplay at above the display’s native resolution, I tested 8 titles at both 1080p (native) and 1440p. While 4K would be possible for certain titles, 1440p is really the cut-off I’d recommend. For 4K, or “fantastic” 1440p gaming, I’d recommend opting for the GTX 1070 or even better, GTX 1080.